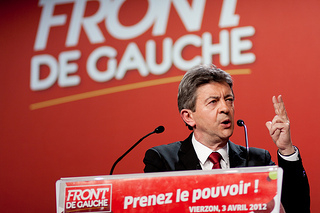 At a rally in Limoges last week, Mélenchon lifted the crowd with another one of his characteristic performances. He was eloquent, unashamed at blasting conventional politics, and resolute in the pursuit of his cause in France. “Yes, there are thousands of red flags at the Bastille again… Yes, we are very dangerous,” he said to great cheer of the crowd in English. But he went a bit farther than criticizing the Anglo-Saxon world for its economic doctrines, and somewhat unexpectedly started ranting about the English language. “We speak fluently “globish”… the language of the occupier – the occupier of our minds.” he said. “Our battle is a cultural battle”, he added, calling French the “language of the heart” and English the language of “accounting”. Mélenchon’s assertions strikes a chord in France where excessive Anglo-Saxon style economic liberalization is seen as menace. The appeal of his campaign has so far rested precisely in his image as an audacious, outspoken leader. But this bluntness can be prone to regress to over-simplification and empty populism, especially in election time. 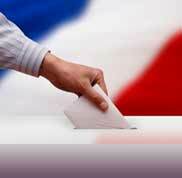 In any case, it must be admitted, Mélenchon has changed the dynamic of left wing politics in France. Perhaps even in Europe.